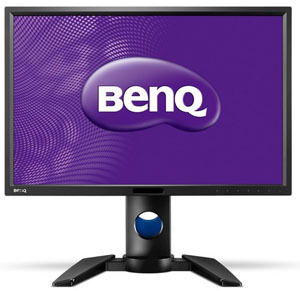 BenQ are well known for their gaming monitors in recent years, with their XL series being very popular in the gaming community. They also have a wide range of more general and office-type monitors available in their EW and GW series which again have been very popular. Now BenQ are looking to expand into other areas with their Pro Graphics (PG) series, bringing with it a range of high-end features designed for colour critical work and professional users. The PG2401PT is the first model produced in this new range and is 24" in size but with a fairly rare 1920 x 1200 resolution which will please some users. It is designed for soft-proofing and comes with all kinds of colour certifications, as well as featuring various extras designed for accuracy. 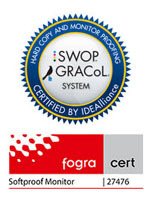 The PG2401PT is printing-industry colour certified (G7/Forga) and comes with a thorough factory calibration and includes a unit-specific calibration report. The screen uses a 10-bit capable AH-IPS panel from LG.Display with a wide gamut GB-r-LED backlight offering 99% Adobe RGB colour space coverage. 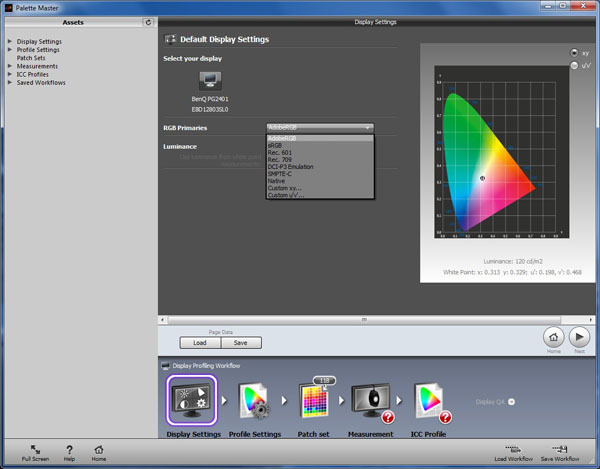 There is a hardware programmable 14-bit 3D Look Up Table (LUT) with a software package co-designed by BenQ and X-rite (note you will need a compatible colorimeter for hardware calibration, not provided), and also a uniformity compensation feature. We will look at all of these high-end features throughout the course of the review, as well as testing all the usual areas we look at. The BenQ PG2401PT offers a very wide set of connectivity options for modern uses which was great to see. All the major connection variations are included, with DVI, D-sub (VGA), HDMI, DisplayPort and Mini DisplayPort offered. In the box the cables are provided for power, DVI, D-sub and DisplayPort > Mini DP. The HDMI cable is not provided however. The screen has an integrated power supply and so it only needs a standard kettle lead. There is a built-in 2 port USB 3.0 hub as well on this model, with both on the left hand side of the screen for easy access. The ports are the latest USB 3.0 generation which is pleasing. The screen also has an 8-in-1 card reader which is also located on the left hand edge of the screen. There are also ambient light and human motion sensors available which can be of practical use, especially in office environments. A monitor hood is also packaged in the box for those who need it. The only thing missing (although not missed!) are integrated speakers. BenQ have done a great job providing all the extras and features you could really want. The PG2401PT comes in a mostly black design, with some blue highlights in places. The bezel and stand are a matte black plastic and there is a BenQ logo in the bottom left hand corner. The bezel measures ~16mm thickness along the top and side edges, and ~21mm along the bottom edge. In the middle of the lower bezel is a shiny black section which contains the human motion and ambient light sensors. Plastics and build quality are good. The rear of the screen is again a matte black plastic. The stand is easily attached and detached and provides a nice sturdy base for the screen. On the back of the screen you may notice a small blue headphone hook, and the cable tidy hole also has a blue retractable trim which looks nice. A view of the screen with the supplied monitor hood is also provided above. The base of the stand is a V shape but provides a nice sturdy base for the screen on the whole. The screen wobbles a little bit when knocked but nothing too bad. The left hand edge of the screen has two USB 3.0 ports and the 8-in-1 card reader for easy access. The headphone clip is shown above and can be easily removed if you want. The stand provides a full range of ergonomic adjustments which is good to see. The tilt function is smooth and easy to operate and provides a good adjustment range. The height adjustment range is very good although it's a little stiffer to operate. The movement is smooth though. At the minimum setting the bottom edge of the screen is ~16 mm above the top edge of the desk, which is basically when the bottom of the screen touches the base of the stand. It can go a bit lower if the screen is tilted forward. At maximum height adjustment it is ~163 mm from the edge of the desk so gives you a useable adjustment range of ~147mm when the screen itself is vertical. The side to side swivel adjustment is smooth and easy to use, and the base remains stationary on the desk when you move it. The rotation adjustment is also nice and easy to use and offers a smooth movement. Great to see a full range of options from the stand here. The materials were of a good standard and the build quality felt good as well. There was no audible noise from the screen, even when conducting specific tests which can often identify buzzing issues. The whole screen remained pretty cool even during prolonged use as well which was pleasing. The interface options on the back of the screen are shown above. There is a power on/off switch and power input on the left. Then there are audio, Mini DisplayPort, DisplayPort, DVI, HDMI and D-sub connections available. The USB upstream port is on the right hand side as well. The OSD menu is controlled from a series of 6 touch-sensitive buttons on the lower right hand edge of the front bezel. There are 6 small etched circles on the front bezel to mark where the controls are. There is also a touch-sensitive power button which glows white during operation and pulsates on and off (white) during standby. If you hover your finger near any of the buttons they all light up as they have proximity sensors. Pressing any of the buttons pops up the quick launch menu as shown above just above where the buttons are on the screen. You can change from within the main OSD what the first 4 options are using the "custom key" options. 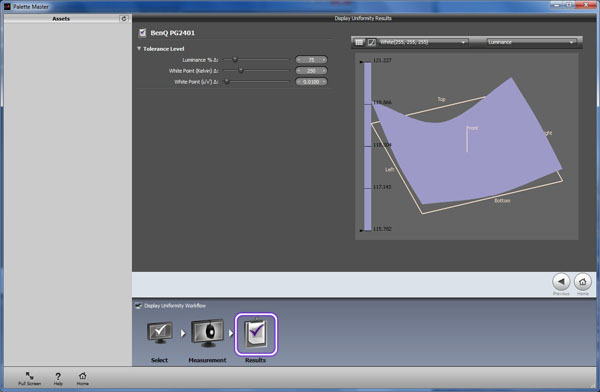 Here we have quick access to input selection, preset modes, brightness and contrast. There is then access to the main OSD menu. The buttons aren't labelled so you do need to remember what each of the symbols represents. They are pretty logical though thankfully. The quick launch menus pop up as shown above for the input and preset mode menu. There is no "auto detect" option within the input menu so you do have to manually switch to the input you want to use. Also the brightness and contrast menus are shown above. Bringing up the main OSD gives you the above. The menu is split into 6 sections down the left hand side and the options available within it are listed on the right. The first section is the 'display' menu where you can control the input selection, aspect ratio control (options for full, aspect and 1:1) and various things related to an analogue input signal. A nice touch we felt was that each section of the menu is colour coded which helps highlight which menu you are currently using, in this case it's a light blue colour. Further down this section are also the options shown above. Once you've set what you want you need to use the "save color settings" option to save them to either 'custom 1' or 'custom 2' presets. The third section is the 'ergonomics' section. Here you can access the Eye Protect ambient light sensor and the Smart Reminder function. Useful for office environments we felt. The ECO menu gives you access to the human motion sensor. The PIP/PBP menu allows you to control the settings related to Picture In Picture and Picture By Picture if you want to use them. You can define what each of the quick access buttons will do here which is useful. All in all the menu offered a very wide range of options and plenty to play with. Navigation was mostly ok, although sometimes it did feel like you had to drill through several layers to get where you wanted. The menu doesn't remember where you last were either, so it can be a bit fiddly if you want to get back to your last setting quickly. 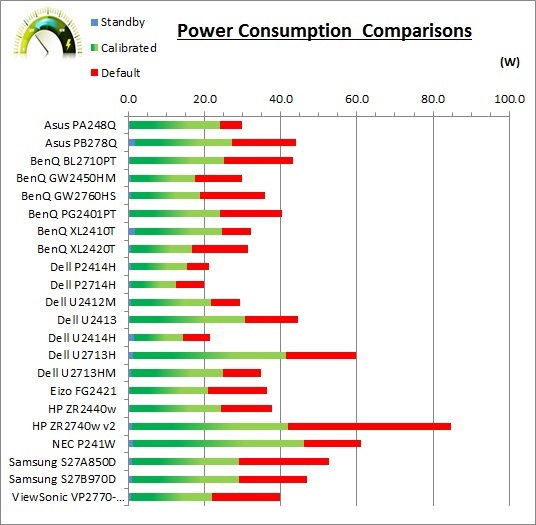 In terms of power consumption the manufacturer lists 74.6W typical usage during operation and 0.5W in standby/power save mode. We carried out our normal tests to establish its power consumption ourselves. The BenQ PG2401PT utilises an LG.Display LM240WU9 AH-IPS panel which is capable of producing 1.07 billion colours from a palette of 4.4 trillion. This is achieved with an 8-bit colour depth panel and an additional Frame Rate Control (FRC) stage (8-bit + FRC) as opposed to a true 10-bit panel. The screen features a 14-bit 3D LUT which provides the 4.4 trillion colour palette and can help improve grey scales and gradients. The 8-bit+FRC panel is a measure commonly taken on modern IPS panels, and the FRC algorithm is very well implemented to the point that you'd be very hard pressed to tell any difference in practice compared with a true 10-bit panel. You need to take into account whether the 10-bit colour depth this is practically useable for you and whether you're ever going to truly use that colour depth. You need to have a full 10-bit end to end workflow to take advantage of it which is still quite expensive to achieve and rare in the market, certainly for your average user. This includes relevant applications and graphics cards as well, so to many people this 10-bit support might be irrelevant. Given the PG2401PT's position as a professional grade, high-end screen, it's pleasing to see the support included. The screen coating on the PG2401PT is much like that featured on other recent IPS screens which has been a positive change. It is a normal anti-glare (AG) offering as opposed to any kind of glossy coating. However, this is contrary to a lot of other older IPS based screens which usually feature a grainy and aggressive solution. Instead it is a light AG coating which retains its anti-glare properties to avoid unwanted reflections, but does not produce an overly grainy or dirty image. It's not a full semi-glossy appearance like some screens but it is nice and light. There is no sign of any cross-hatching type issues from the panel either. Like the Dell U2413 screen (which uses the same panel as the BenQ), a new type of backlight has been used with LG.Display's latest generation of IPS panel. They wanted to be able to offer the benefits of LED backlighting (lower power consumption, lower heat output, thinner profile) but deliver a wide colour gamut support for colour critical work and the professional users. To achieve this, they have moved to the new GB-r-LED backlight system. 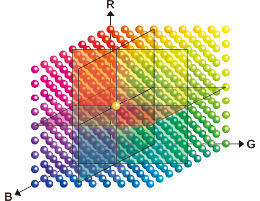 The common White-LED (W-LED) backlight systems, despite their name, do not actually use White LED's, but rather they emit a blue light which passes through a yellow phosphor to give a more neutral white and provide the red and green components of the image. With the new GB-r-LED backlights, rather than using this blue diode + yellow phosphor, the backlights combine green and blue diodes with a red phosphor. With this new type of LED backlight the screen covers 104% of the NTSC reference, 99% of the Adobe RGB reference and 100% (and beyond) of the sRGB space. The screen is of course classified as a wide gamut display so you need to consider whether this is something you want or need for your uses. For those who don't want to work with wide gamut content or contend with complications around colour management or oversaturated colours, an sRGB emulation preset mode is also provided thankfully. At 100% brightness there is a constant voltage applied to the backlight and no flicker is introduced. As you start to lower the brightness control a very high frequency oscillation is introduced which applies all the way from 99 to 0% adjustment. 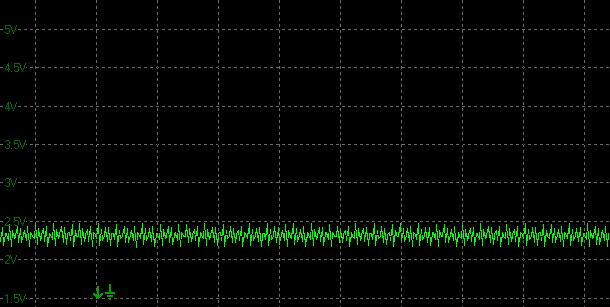 This isn't a normal "full" PWM oscillation and the amplitude (difference between the 'on' and 'off' states) is very low. 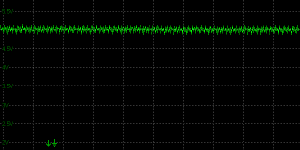 The backlight is not being cycled off in the normal PWM-style. We have provided a smaller scale view at 0% brightness above as well. From this we can calculate that the screen is using a very high oscillation frequency of 16,500Hz. This shouldn't present any real problems to most users, although the screen isn't fully flicker free. We noticed another slightly odd behaviour during these measurements where every now and again there seemed to be a slightly larger oscillation. This didn't seem to be within any pattern, but occasionally the brightness of the backlight would drop slightly further than normal (not visible to the naked eye). The above examples show this occasional random drop in the brightness output. We left the screen at default settings apart from turning the uniformity compensation feature off. That impacts luminance and contrast ratio which we will look at later on in the review. The brightness control gave us a reasonable range of adjustment overall, although it was a little lacking at the lower end. At the top end the maximum luminance reached 314 cd/m2 which was a bit lower than the specified maximum brightness of 350 cd/m2 by the manufacturer. There was a 205 cd/m2 adjustment range in total, and so at the minimum setting you could reach down to a luminance of 109 cd/m2. This should be more than adequate for general lighting conditions but may be too high for those wanting to work in darkened room conditions with low ambient light. A setting of ~6 in the OSD menu should return you a luminance of around 120 cd/m2 at default settings. It was possible to achieve a lower minimum luminance if you turn the uniformity compensation feature on, and the minimum we recorded was 63.25 cd/m2. However this severely impacted contrast ratio, reducing it to 452:1. A partial solution though if you want to use the screen in lower ambient lighting conditions. On a side note, the uniformity compensation feature seems to work very well, so it may well be something users want to make use of. We have plotted the luminance trend on the graph above. The screen behaves as it should in this regard, with a reduction in the luminance output of the screen controlled by the reduction in the OSD brightness setting. This was pretty much a linear relationship as you can see from the shape of the graph. It should be noted also that the brightness regulation is controlled by a high frequency (16,500Hz) Pulse Width Modulation (PWM), although not with a full amplitude which you would see on most PWM screens. 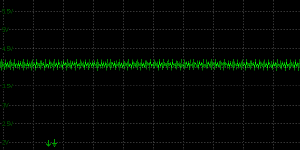 It can't be classified as flicker-free, but the frequency and low amplitude should hopefully mean it is not problematic to most users. 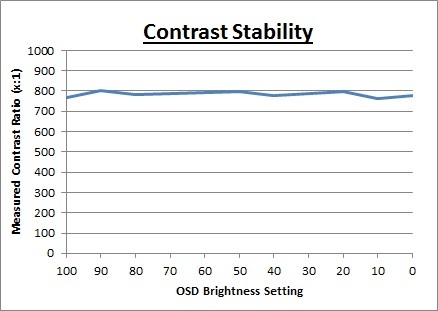 The average contrast ratio of the screen was 785:1 and it remained stable across the brightness adjustment range as shown above. It was moderate for an IPS panel and not as high as we've seen from other modern panels of this type. 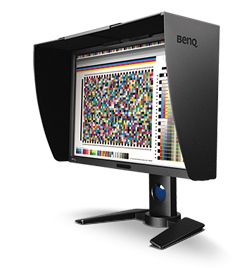 BenQ PG series monitors are tested against standard printing colour charts and real printing house results to determine which aspects of colorations prove to be the most challenging for graphic professionals. 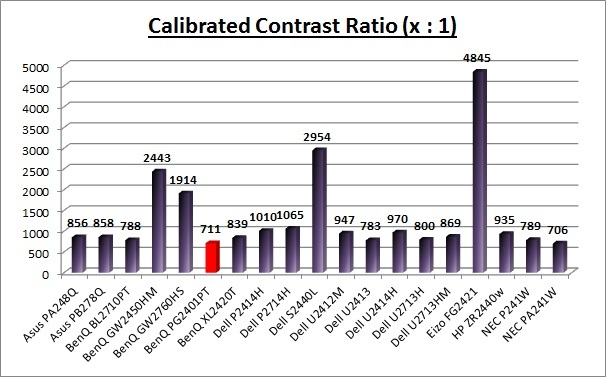 As defined by these test results, the BenQ PG series specializes in colour reproduction for tones with a Delta-E value lower than two (dE <2). BenQ PG series monitors are Printing-Industry Color Certified (G7/Fogra) according to international ISO standards that improve design and proofing efficiency and lower total cost of ownership. 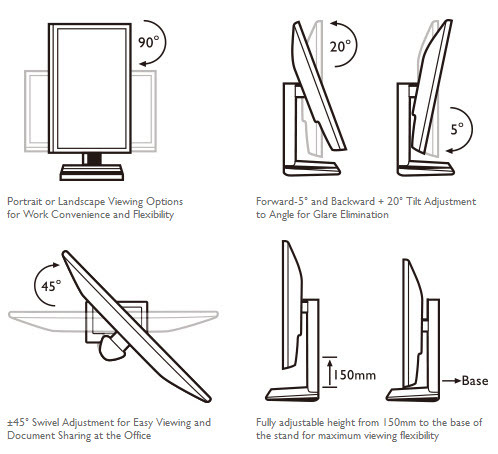 Each BenQ PG series display is subjected to a verification process on-site upon production in order to test the performance of the monitor in terms of Brightness uniformity, Delta-E and Gamma curve. These results are validated against BenQ and industry colour standards—the results of the test are noted on a calibration report, included with each individual PG series monitor. The calibration report which came with our sample is shown above for reference. It confirms the screen comes factory calibrated to a 6500k white point and 2.2 gamma. dE should also be <2 and BenQ have also carried out some uniformity correction measurements for that uniformity compensation feature which we will test later on in the review. For now we can test the factory calibration at least. The only thing we changed in the OSD initially was turning the uniformity compensation feature off. Out of the box the screen was very bright and colours felt vivid. You could tell the screen was wide gamut straight away and greens in particular looked oversaturated. It comes out of the box in the 'standard' preset mode, and with color gamut set to Adobe RGB. You can change this to sRGB as well in the 'standard' mode, which we will test in a moment. 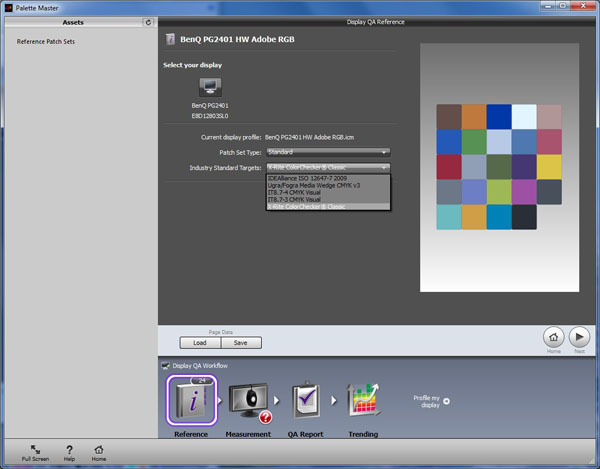 There are also defined 'Adobe RGB' and 'sRGB' preset modes available in the OSD menu. The colour temperature and whites felt about right so we went ahead and measured the default state with the i1 Pro. 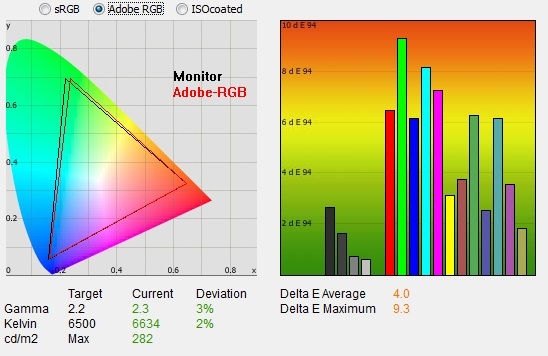 The CIE diagram on the left of the image confirms that the monitors colour gamut (black triangle) matches the Adobe RGB colour space reasonably well, with some over-coverage evident in some green shades and some under-coverage also. 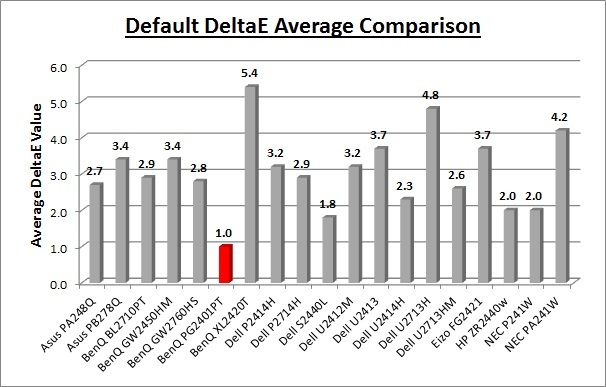 Default gamma was recorded at 2.3 average, leaving it a little out with an 3% deviance from the target of 2.2. White point was measured at 6634k leaving it a small 2% out from our target of 6500k which was very pleasing. Note that we are using a spectrophotometer to make these measurements which is not sensitive to the wide gamut backlight as some colorimeter devices can be. When using a standard gamut colorimeter not designed to work with modern backlighting units like W-LED, WCG-CCFL and GB-r-LED there can be a typical deviance of 300 - 600k in the white point measurement which is why some sources may refer to a different white point in this test incorrectly. Luminance was recorded at a very bright 282 cd/m2 which is too high for prolonged general use, and needs to be turned down. The screen was set at a default 75% brightness in the OSD menu but that is easy to change of course to reach a more comfortable setting without impacting other aspects of the performance. The black depth was 0.36 cd/m2 at this default brightness setting, giving us a moderate IPS static contrast ratio of 780:1. 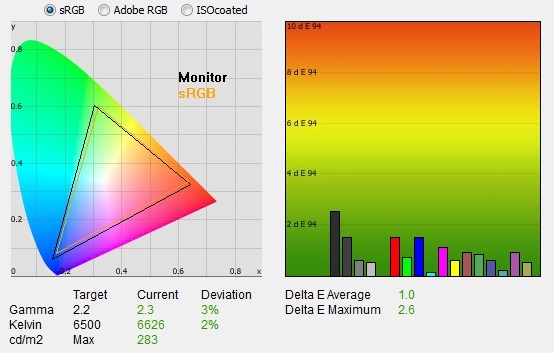 Colour accuracy measurements are based on a comparison with sRGB so should be ignored here. Testing the screen with various gradients showed smooth transitions with no sign of any banding thankfully. There was some very slight gradation evident in darker tones as you will see from most monitors but not something you'd see in normal use though at all. The default setup was pretty good, although it was too bright. The factory calibrated white point and gamma were only slightly off by our measurements. We will be able to test the colour accuracy setup in the next section once we are measuring the sRGB colour space. Incidentally, the actual 'Adobe RGB' preset mode in the menu has exactly the same setup as the standard mode here, just with the brightness set at 50% instead of 75%. The other results were identical. The 'color gamut' setting was switched to sRGB now which emulates the smaller standard gamut colour space nicely. The colour space is now very close to the sRGB reference although it doesn't match exactly. 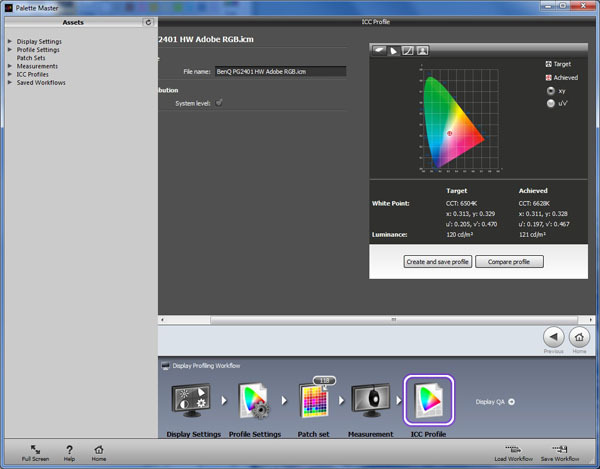 Default setup was very similar to before when we were in the 'Adobe RGB' gamut. 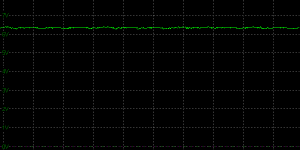 Gamma was still at 2.3 with a 3% deviance, and white point was 2% out at 6626k. Luminance was still too high for comfortable use, and contrast ratio was basically the same at 775:1. We can at least now use the dE measurements as they are comparing against the sRGB reference. dE was on average very low at 1.0 which was excellent. This represented a very good factory calibration, with only minor tweaks needed really to improve gamma and white point slightly. Again there is a defined sRGB preset available in the menu which performs identically to this 'standard' mode (set with sRGB colour gamut). The only difference is it has a default brightness setting of 50% instead of 75% in the standard preset. Some of the colour temperature modes offered reasonable levels of accuracy. Overall there was a maximum deviance from the target of 4.6%, and an average of 3.2% which wasn't too bad but not perfect. 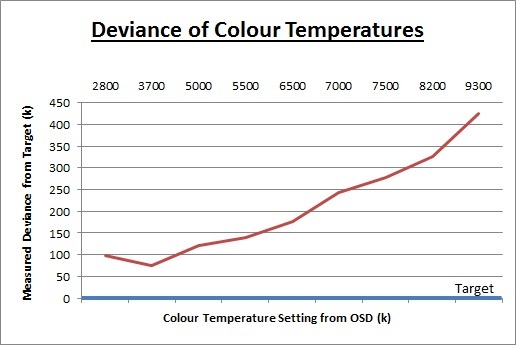 The warmer settings were closer to their desired temp with a deviance of around 76 - 121k. As the setting got cooler, there was a larger temp difference ranging up to 425k maximum at the coolest setting. 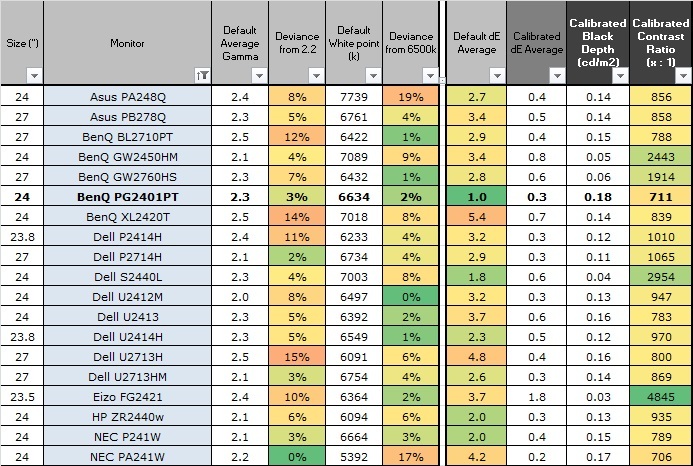 The PG2401PT may well have a decent factory setup but given the market for this screen I expect many users will want to calibrate the screen personally to obtain even higher levels of accuracy and allow profiling and matching between different devices. Remember, you need to ensure you have a calibration device capable of measuring and reading the spectra from the GB-r-LED backlight unit properly. Many older colorimeter devices are designed to work with standard gamut CCFL units only and so they can often have difficulty reading LED (and wide gamut CCFL) units properly. A spectrophotometer does not have this problem and there are also some decent modern colorimeters like the X-rite i1 Display Pro which should be able to read LED without issue. While you can use other devices and various software packages to complete software profiling of the screen, you may come across issues if the device is not designed to work with an LED backlight unit. The PG2401PT also offers hardware calibration which can give you very high levels of accuracy and control over the monitors hardware LUT itself. We will look at that in a moment, but we also wanted to carry out the usual software level "calibrations" (profiling) at a graphics card level. We used the X-rite i1 Pro spectrophotometer combined with the LaCie Blue Eye Pro software package to achieve these results and reports. 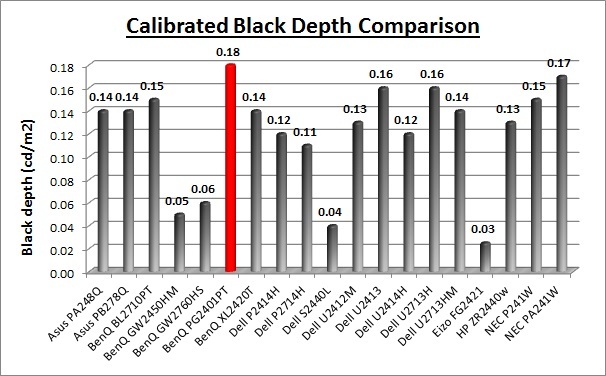 An X-rite i1 Display Pro was used to validate the black depth and contrast ratios due to lower end limitations of the i1 Pro device. We first of all reverted to the 'custom 1' preset mode in the OSD menu to allow us to set up a preset specifically to our requirements. We left the color temp setting at 6500k and gamma at 2.2 as they had been very close to their targets out of the box, and the software profiling would make the minor corrections needed. We set 'custom 1' mode to use the Adobe RGB gamut, and we will set 'custom 2' to sRGB in a moment to calibrate in that colour space. Once you've set your OSD settings how you want, you have to go into the option to save the colour settings, at which point it saves them to either 'custom 1' or 'custom 2'. This way we can set up two software calibrated modes so we can quickly and easily switch between them if we want, remembering we will also need to switch the active ICC profile when we do. We left the LaCie software to calibrate to "max" brightness which would just retain the luminance of whatever brightness we'd set the screen to, and would not in any way try and alter the luminance at the graphics card level, which can reduce contrast ratio. These adjustments before profiling the screen would help preserve tonal values and limit banding issues. After this we let the software carry out the LUT adjustments and create an ICC profile. Average gamma had been corrected to 2.2 average according to the initial test, correcting the default 3% deviance we'd found out of the box which was good. The white point was also corrected to 6527k, correcting the minor 2% deviance we'd seen out of the box. Luminance had also been improved thanks to the adjustment to the brightness control and was now being measured at 120 cd/m2. We did have to lower the brightness control all the way down to 4%, so there is minimal adjustment left if you want to work with a darker screen. This left us a black depth of 0.17 cd/m2 and a moderate IPS static contrast ratio of 717:1. If you turn on the uniformity compensation feature you can achieve a lower luminance, but the contrast ratio is negatively impacted. 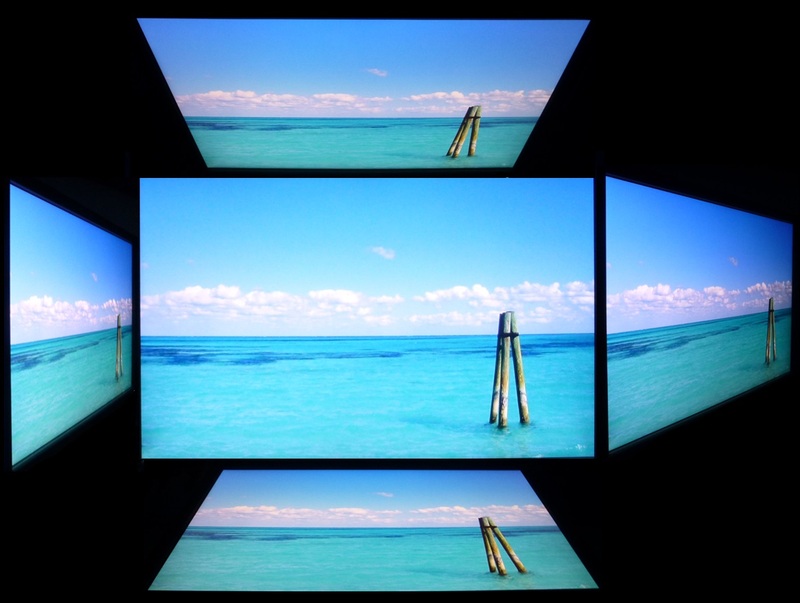 Testing the screen with various colour gradients showed smooth transitions. There was some slight gradation in darker tones but no banding was introduced which can often happen where adjustments are made to the graphics card LUT from the profilation of the screen. You can use our settings and try our calibrated ICC profile if you wish, which are available in our ICC profile database. Keep in mind that results will vary from one screen to another and from one computer / graphics card to another. We also carried out a software calibrated based on the sRGB colour space, with the settings listed in the table above which we saved to 'custom 2' mode. The calibration was again a success. 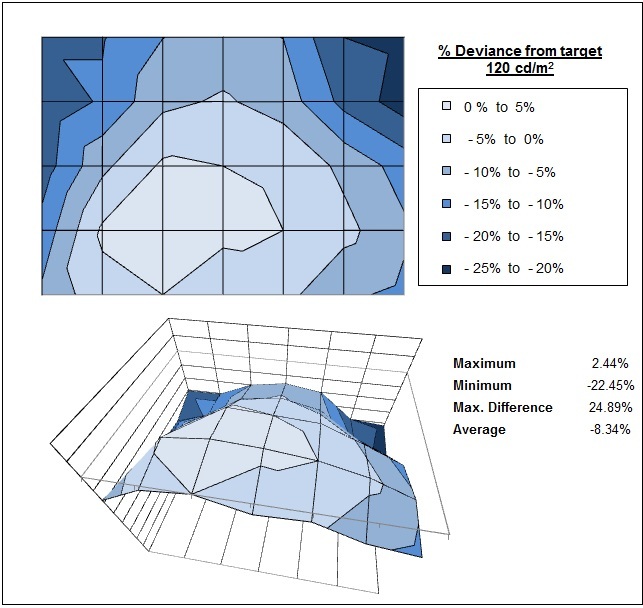 We had corrected the default 3% gamma and 2% white point deviance out of the box nicely. Colour accuracy was also improved a little, although the default factory setup was very good in this area. It had improved from dE average of 1.0 (out of the box) to 0.3 now. Colour gradients remained free from banding and contrast ratio was comparable with before. One thing which separates this screen from many mainstream monitors is the support for hardware calibration. Users can program the monitors 14-bit 3D Look Up Table (LUT) if they have the appropriate software and hardware to achieve higher levels of accuracy, something which professional users require and one of the reasons why pro-grade screens from NEC and Eizo have always been popular in such markets. 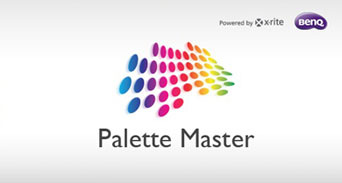 The provided "Palette Master" software is co-produced by BenQ and X-rite and is similar in fact to the Dell software we tested recently for the UP3214Q display. There are a few differences, and a couple of extra features in fact which we will look at here. 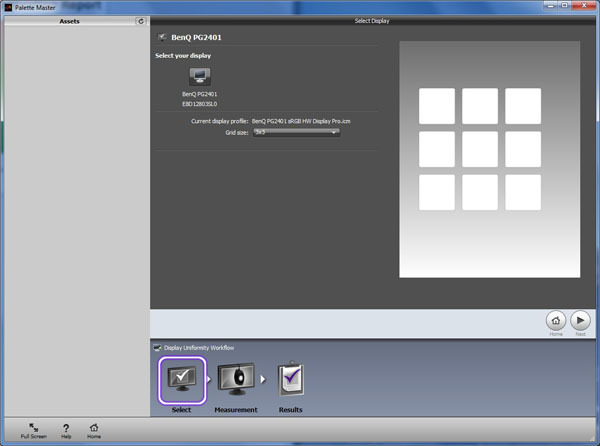 There is a useful guide/walkthrough of the software on BenQ's website here as well. You will require a compatible calibration tool to work with this software and allow hardware calibration. The only devices supported by the software at this time (again, like the new Dell software) are the X-rite i1 Display Pro, i1 Pro and i1 Pro 2 devices. We'd like to see support for other devices like the ColorMunki, but support for the current devices is pretty good anyway. The software will be fairly familiar to anyone who's used X-rites i1 Profiler package, and looks pretty similar overall. There are options on the front screen to choose your calibration device. On the left hand side are the three options available for profiling (the actual calibration process), quality (a reporting feature) and uniformity (measuring screen uniformity). 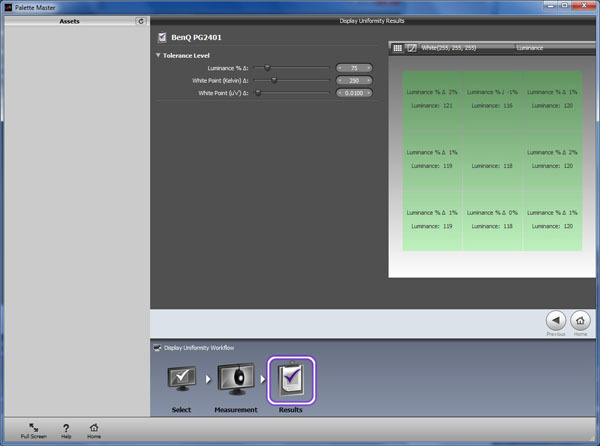 Entering the profiling section allows you to select the desired colour gamut you want to calibrate to, as well as the target luminance. Each of the pre-defined colour spaces have a preset gamma and white point relevant to their colour space, but you can also use the custom options if you want more control yourself. Once selected you can just press 'next' to go through the other options including defining the ICC profile settings, sample set for measurements and then calibrating your device if need be before the process starts. We won't go into them in detail as you can see the guide linked on BenQ's site if you want more screenshots. The actual calibration process is automated but takes a long time to complete, even with smaller sample sets (less accurate). You have two modes you can calibrate which are saved as 'calibration 1' or 'calibration 2' in the preset mode menu. You can also choose within the calibration options whether the uniformity compensation feature is turned on or off, as once the calibration has completed you can't change much from within the OSD manually (including that feature). Once complete you are asked to save the ICC profile and presented with some brief results around achieved white point and luminance. Pressing the 'Display QA' arrow at the bottom takes you to some validation options as well. There are various different patch sets and validation options to select which will take various measurements and confirm the success of your calibration. Nice to see this reporting feature included. We will carry out some hardware calibrations in a moment and also validate the results using our normal LaCie Blue Eye Pro report feature for easy comparison. 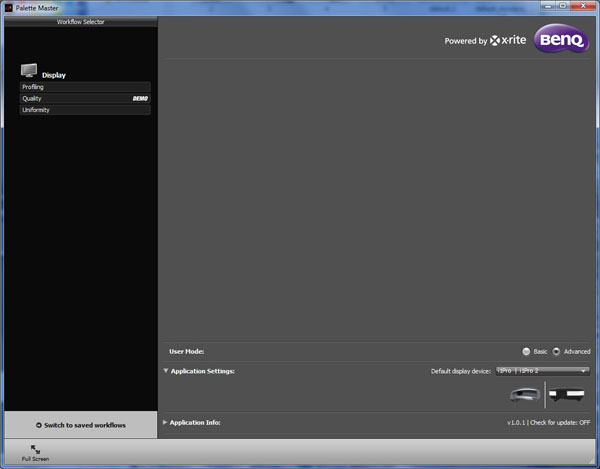 The 'uniformity' option is something new to this software and not something included in Dell's calibration package. It allows you to quickly and easily measure a grid on your screen and then confirms your uniformity of whites, greys and black. This is a useful feature and handy to test your specific units uniformity. You may want to experiment with the uniformity compensation feature as well to see whether they helps for your particular needs. We carried out the hardware calibration first of all with the i1 Pro device in the Adobe RGB gamut option. We then used the LaCie report function to validate the results. As with our other calibrations earlier, uniformity compensation was left off. The hardware calibration was on the whole pretty good. 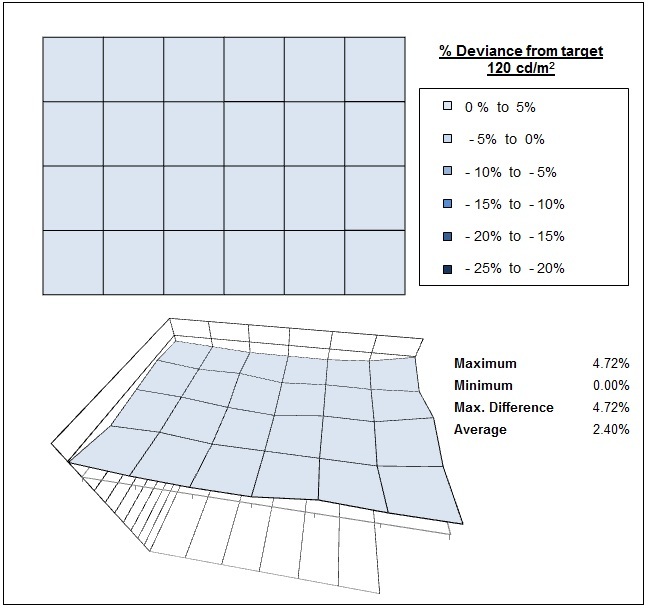 The 3% default gamma deviance we'd seen out of the box had been corrected to within 1% now, although the white point remained 2% out from the target according to these tests. Luminance was actually a bit higher than the specified 120 cd/m2, resulting in a measurement of 128 cd/m2 instead. We had seen something similar from the Dell calibration software as well, and you may need to specify a lower luminance in the hardware calibration process to achieve a resulting luminance nearer to 120 cd/m2. Colour gradients were smooth with no sign of banding. One thing to note is that once you've completed the hardware calibration, you cannot manually change the brightness in the OSD menu. You'd have to carry out a completely new calibration again to change the luminance which is a real pain, especially if you want to work with your calibrated modes in different lighting conditions. Given the HW calibration takes so long to complete, it's not practical to have to go and redo it all again just to change the brightness of the screen. It was also a pain not to be able to turn things like uniformity compensation on from within the OSD menu. Again you have to set that at the beginning of the HW calibration so you'd have to redo it all again if you decide you want to turn that on. The default sRGB mode had a very reliable factory setup anyway but this HW calibration did help improve things nicely. The 3% gamma deviance out of the box was corrected within 1%, and the 2% white point deviance was now a bit closer with only a 1% error. Again luminance was a bit higher than specified in the process. Colour gradients were again very smooth, and colour accuracy was excellent with a dE average of 0.3 now, down from 1.0 out of the box (which was excellent anyway). We saved this as 'calibration 2' in the preset menu, and it was good to be able to have one mode set up as Adobe RGB and another as sRGB. It's just a shame you need to repeat the HW calibration process if you ever want to alter brightness or turn uniformity compensation on/off. Default setup of the screen was very good overall, and should be fine for most users even without access to a calibration device. There was only a minor deviance in the desired gamma, with a 3% error and a minor 2% error in the white point as well. Colour accuracy was excellent in the sRGB mode (where we could use the dE measurements compared with the sRGB colour space), with an average dE of 1.0. The panel was weaker when it came to black depth and contrast ratio unfortunately. At 711:1 after calibration (software calibration in the sRGB mode) it was only moderate for an IPS panel. We had seen some IPS panels reach up to over 1000:1, like the Dell P2414H (1010:1) for instance. The PG2401PT was comparable, but slightly behind the Dell U2413 (783:1) which uses the same IPS panel. Other panel technologies like the AMVA based BenQ GW2450HM and GW2760HS can reach much higher contrast ratios than any IPS panel at the moment, around 2000 - 2500:1 in fact. The MVA panel in the Eizo FG2421 was even better at 4845:1. Viewing angles of the PG2401PT were very good as you would expect from an IPS based panel. Horizontally there was very little colour tone shift until wide angles past about 45°. Contrast shifts were slightly more noticeable in the vertical field but overall they were very good. The screen offered the wide viewing angles of IPS technology and was free from the very restrictive fields of view of TN Film panels, especially in the vertical plane. It was also free of the off-centre contrast shift you see from VA panels and a lot of the quite obvious gamma and colour tone shift you see from some of the modern AMVA and PVA offerings. All as expected really from a modern IPS panel. On a black image there is a characteristic and fairly typical IPS white glow, but in normal working conditions this shouldn't present much problem. The above image was taken in a darkened room to demonstrate the white wide angle glow when viewing a black screen. There is no A-TW polarizer on this panel which is rarely used now in the market but was implemented on some older screens to improve the off centre black viewing. The PG2401PT features a uniformity compensation feature designed to help improve the uniformity of the screen, and something only really available on high end screens like this. It is available in the 'system' section of the OSD menu as shown above with a setting for on and off available. First of all we tested the screen with the feature off. The uniformity compensation feature made a huge difference. The whole screen was now within 5% deviance from the centrally calibrated 120 cd/m2 and it did a great job of correcting the darker regions in the upper corners. This feature had been very well set up it seems and it was great to see it could correct the uniformity so well if you needed. There is a draw back to using this feature unfortunately in that it reduced the static contrast ratio quite a bit, from around 785:1 (set off, before calibration) to 452:1 (turned on). That is common to other screens with uniformity correction though including NEC and Eizo offerings. The feature does have the added benefit also of making the screen darker, helping to overcome some of the issues with the somewhat limited minimum brightness setting we'd seen before. 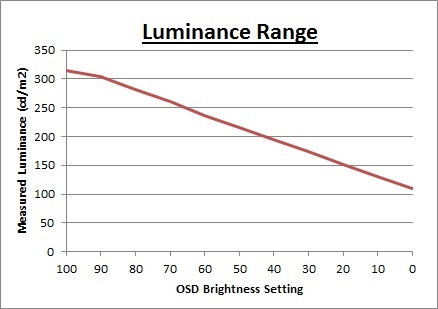 This means you can achieve a lower luminance if you need to as well for darker working conditions. A setting of 46 brightness was actually needed to reach ~ 120 cd/m2 now when uniformity compensation was turned on, instead of 4 which we'd set it at before. The other good thing about this feature is that it can be used regardless of your brightness and colour gamut setting in the OSD, so you aren't locked to only using it in only certain presets or at certain pre-defined brightness/contrast levels like you are on the recent Dell screens. If you want to use the feature for hardware calibrated modes you need to specify it as an option at the beginning of the calibration software, as you cannot then turn it on or off within the OSD once in those modes. As usual we also tested the screen with an all black image and in a darkened room. A camera was used to capture the result. Three was some slight clouding in the upper left hand corner and some wider clouding in the bottom right corner of the screen. It wasn't something you can see during normal day to day use, but perhaps could prove problematic if viewing a lot of dark content in low ambient lighting. The 1920 x 1200 resolution and 24" screen size give a nice decent area in which to work and the vertical resolution is a little more than the wide range of 16:9 aspect 23 - 24" models (1920 x 1080) out there in the market. A lot of people prefer this extra vertical area and it is useful for office applications we think. You may want to consider the fact that high resolution 27" 2560 x 1440 models are becoming increasingly available and so the difference in desktop size is certainly noticeable coming from a 27" screen like that. Nevertheless, the 24" 1920 x 1200 resolution should be adequate for many users. The screen offered a comfortable 0.27mm pixel pitch which delivered easy to read text at a nice size. The resolution is big enough for side by side split screen working as well in many cases. The light AG coating of the new AH-IPS panel is certainly welcome, and a very positive change from the older grainy and 'dirty' appearance of older IPS AG coatings. The wide viewing angles provided by the IPS panel technology on both horizontal and vertical planes, helps minimize on-screen colour shift when viewed from different angles. The default factory setup of the screen was good in terms of gamma, white point and the balance of colours, with only minor errors from the factory calibration. This means even those without a hardware calibration device can achieve reliable results from this screen. Of course for maximum levels of accuracy and control users will want a compatible calibration device to hardware calibrate the screen. For this, the provided BenQ/X-rite software was easy to use and has a decent range of options and features, including a useful reporting function and even uniformity measurement system. The only issue with HW calibration is that once done, you can't change basic settings like the OSD brightness, or turn uniformity compensation on and off. Having to carry out the whole, very long, process again is not ideal when you want to make a simple change like this. It's understandable to lock other aspects of the menu, but basic control over the brightness would have been useful. 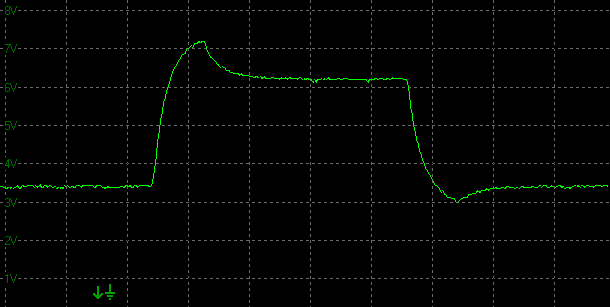 Regardless, the actual HW calibration produced reliable results which was pleasing. The contrast ratio of the PG2401PT was moderate out of the box for an IPS panel at ~780:1 which was ok but not great. 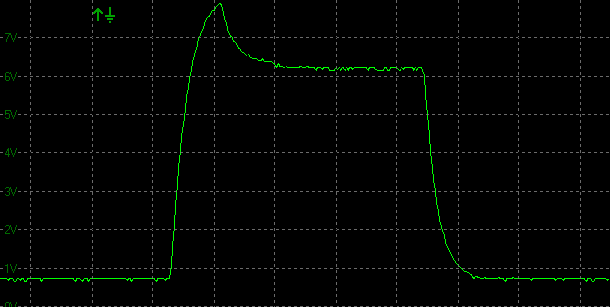 After calibration the contrast ratio was a little lower at around 710:1. The size of the brightness adjustment range of the screen was very good, with the ability to offer a luminance between 314 and 109 cd/m2. However, it was lacking at the lower end with a fairly high minimum luminance. Those wanting to work in darker lighting conditions may find this limiting. Turning the uniformity compensation feature on allows you to reach a lower luminance, down to around 63 cd/m2 if needed, as long as you're prepared to take a hit to your contrast ratio. A setting of ~6 in the OSD brightness control should return you a luminance close to 120 cd/m2 when uniformity compensation is turned off. While we're on the topic of the uniformity compensation, this worked very well indeed and provided a reliable and stable uniformity for those who need it. One issue which may affect some users is that the brightness regulation is controlled through the use of4 Pulse-Width Modulation (PWM), and so those who suffer from eye fatigue or headaches associated with flickering backlights may have concern. 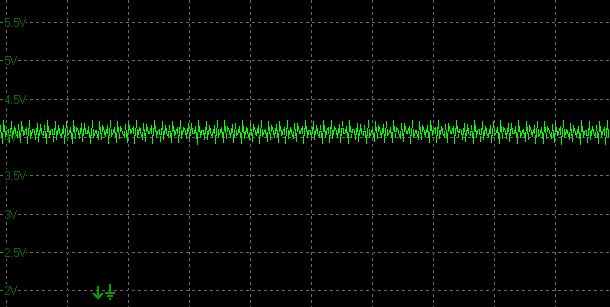 The frequency is very high however and the amplitude very low, so it won't be as bothersome as more traditional low frequency PWM. There was no audible noise or buzzing from the screen, even when specifically looking for it using test images with a large amount of text at once. There are no specific office or text preset modes available from the menu but there's a wide range of different options to play with, and the ability to save two custom modes if you want, as well as the two hardware calibration modes. There are all the connectivity options you could need really from the screen which was great news, as well as the provision of most cables in the box. The screen offers 2x USB 3.0 ports which can be useful and it was nice to keep this up to date with the modern version. There are also some further extras including the ambient light sensor, human motion sensor and 8-in-1 card readers which can be useful in office environments. There was a great range of ergonomic adjustments available from the stand allowing you to obtain a comfortable position for a wide variety of angles. The VESA mounting support may also be useful to some people as well. Even the provided monitor hood was a nice extra, and may be useful to some people in certain environments. 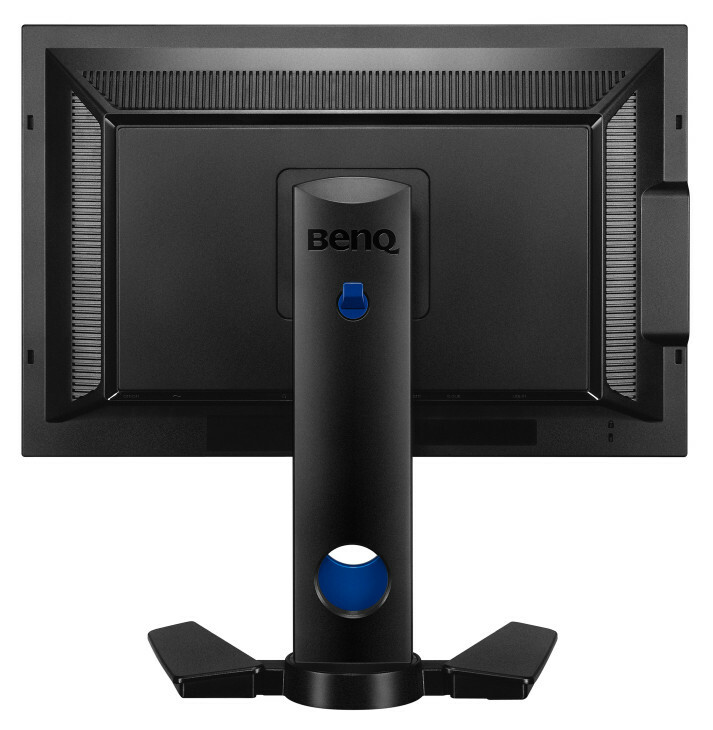 BenQ have clearly thought about the extra features provided with this screen and what it is to offer a high end, professional range monitor. The screen is designed to run at its native resolution of 1920 x 1200 and at a 60Hz recommended refresh rate. However, if you want you are able to run the screen outside of this resolution. We tested the screen at a lower 1680 x 1050 resolution to see how the screen handles the interpolation of the resolution, while maintaining the same aspect ratio of 16:10. At native resolution the text was very sharp as you can see from the top photograph. When you switch to a lower resolution the text is larger of course but still pretty clear, with minimal blurring introduced. The screen seems to interpolate the image well although you of course lose some of the desktop real-estate running at a lower resolution. The PG2401PT is rated by BenQ as having a 5 ms G2G response time and the panel uses overdrive / response time compensation (RTC) technology to boost pixel transitions across grey to grey changes. There is a user control over the overdrive impulse within the OSD menu so we are able to test the screen with and without this option enabled. The part being used is the LG.Display LM240WU9 AH-IPS panel. Have a read about response time in our specs section if you need additional information about this measurement. 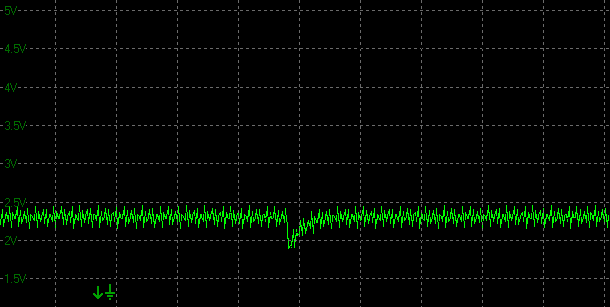 First of all we carried out a smaller set of measurements with the AMA setting turned off and then on. 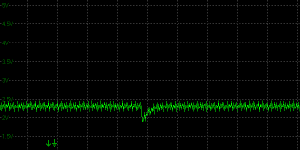 With AMA off the average G2G response time measured in this smaller sample set was 9.6ms. 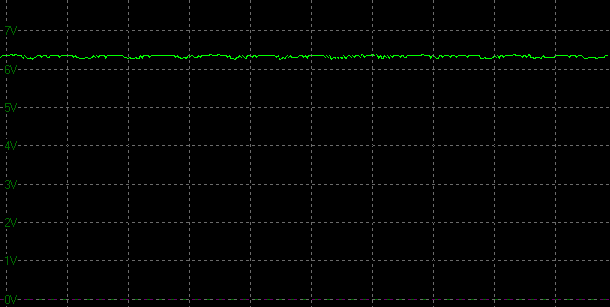 The overdrive didn't seem to be turned off completely though as we still saw some moderately high overshoot on some transitions (11.4% for instance when changing from 50-150). Observing the screen in games and other motion tests showed moderate levels of blur and some apparent overshoot in certain circumstances. 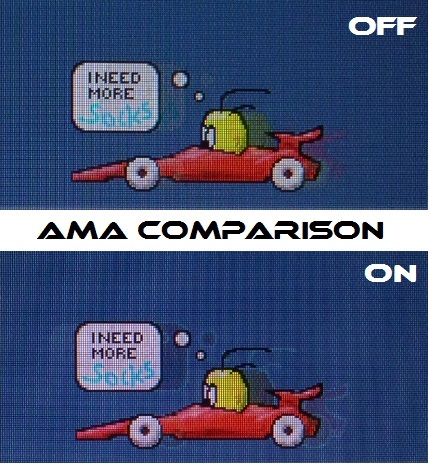 We then tested the screen with AMA turned on. Overall the response time had been improved to 8.0ms G2G average, but there was a much more apparent overshoot problem. 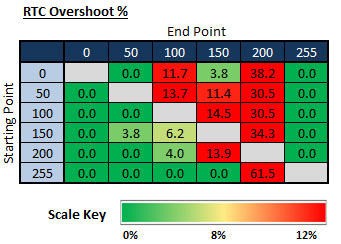 More transitions shown here had high levels of overshoot, even up to 40.8% on 0-150 for instance. In practice there was a noticeable dark and pale trail behind moving objects which was distracting. We felt the motion performance was better with AMA left off as the overshoot was just too severe when it was turned on. 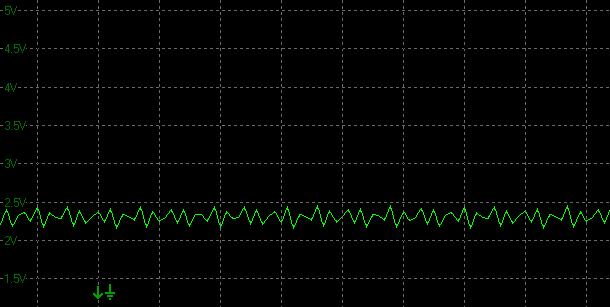 Carrying out simple motion tests using PixPerAn visually confirmed what we had measured with our oscilloscope. Even in the limited range of colour transitions shown in the tool you could see some obvious and pronounced overshoot in the AMA = On setting. A dark and pale trail was evident and was not something you'd want to contend with for moving content and gaming. The response time performance overall was actually a bit better than our initial small sample set, returning a figure of 8.3ms G2G. This was a little off the specified 5ms G2G, but about normal for a modern IPS panel really. Some transitions were much faster actually, down to 3.8ms minimum although not without a resulting overshoot problem unfortunately (see below). Rise and fall times on average were quite similar as well. If we evaluate the Response Time Compensation (RTC) overshoot then the results are not brilliant, even with AMA turned to off. The transitions which had shown the fastest response times (x - 200), where the pixel transition was to light grey shades had large amounts of overshoot. The overdrive impulse was being applied too aggressively to these transitions to light shades and it was resulting in overshoot around 30 - 35%. Even here with AMA off there was some noticeable overshoot, particularly on the changes from dark to light shades (rise times), so you can see why turning it on would just be too much of an issue. In practice you don't see as much overshoot with AMA Off as when it's on, although you can see some in certain colour changes. 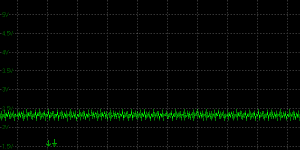 The above oscillogram is an example of the overshoot we saw where the response times were the fastest. In some cases there was also some overshoot on the fall times, changes from light to dark shades. The most severe overshoot measured was when changing from 255-200 as shown above. The above comparison chart shows you the lowest, average and highest G2G response time measurement for each screen we have measured with our oscilloscope system. As you can see, the PG2401PT performed much like the other IPS panels we have tested. With an average G2G response time of 8.3 (this is with AMA set to Off) it was a little faster than models like the Dell U2414H and P2414H (8.9ms) but did show a much higher level of RTC overshoot as a side-effect. It does seem that for IPS panels, a G2G response time around 9ms tends to be about as good as you can get without introducing some noticeable overshoot problems. The Dell U2414H / P2414H models had achieved this without making the overdrive impulse too aggressive and so showed no obvious overshoot problems. 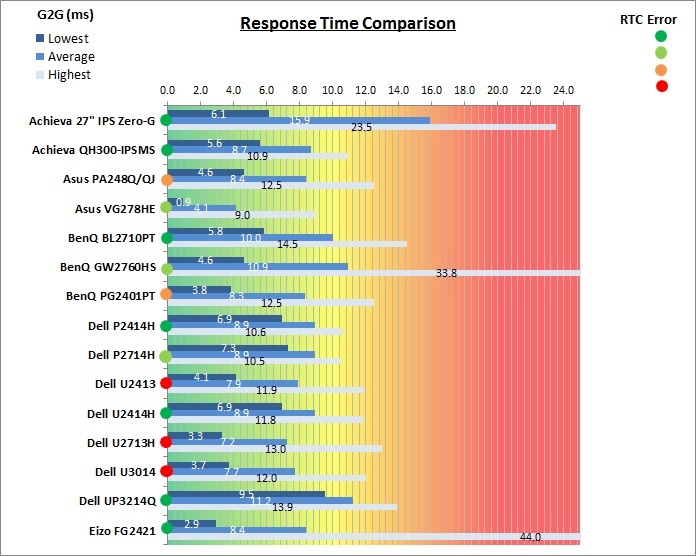 The Dell U2413/U2713H/U3014 models had pushed response times down to 7.2 - 7.9ms G2G, but at the cost of some very severe overshoot. The BenQ PG2401PT was somewhere in the middle. In practice the BenQ PG2401PT showed pretty low levels of motion blur, and no obvious ghosting. There was some some slight trailing in the best case images as you can see above but overall the movement felt pretty good. In these specific colour transitions there was no sign of any obvious overshoot artefacts which was pleasing. We do know though from our oscilloscope measurements that some transitions did introduce a reasonably high overshoot, even with AMA turned off. Testing the screen with other motion content and games did introduce some of this overshoot in certain cases. It was certainly not as bad as when you have AMA turned on though, which introduced significant issues even in the PixPerAn tests. Of course you do need to keep in mind this is an IPS panel, and so does not feel as snappy as a fast TN Film panel, and cannot offer the response time of that panel technology either. Other limiting factors also come into play including the refresh rate (limited to 60Hz here) and motion blur as a result of eye-tracking and the way LCD monitors operate. For an IPS panel at 60Hz it is a reasonable result though. We would have liked to see the overdrive controlled a little better as it was a shame to see there were some overshoot issues even when AMA was off - it's lowest setting. 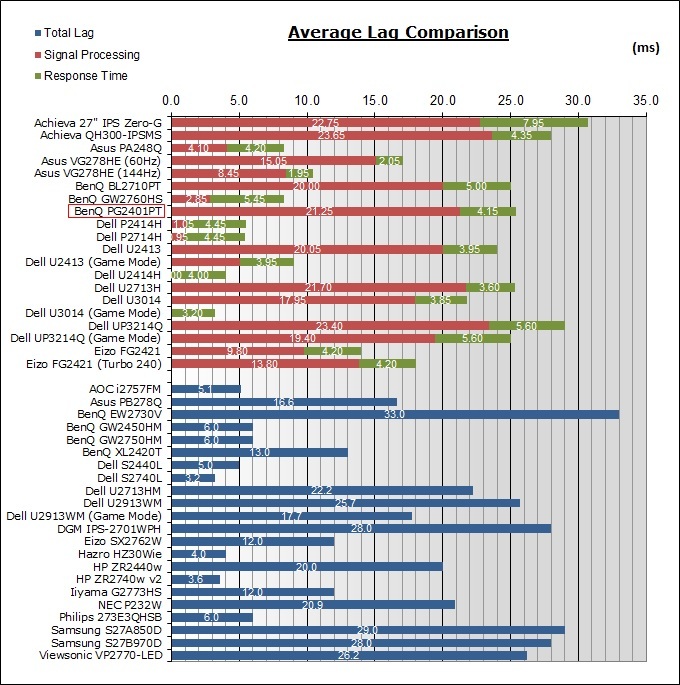 We have provided a comparison of the PG2401PT first of all against 4 of Dell's 24" class screens we have tested. In practice the U2414H and P2414H perform identically, and were a little faster than the PG2401PT. They were also free from the overshoot issues we've discussed on the PG2401PT so would be a better choice for gaming. Of course gaming isn't the target market for the PG2401PT anyway and you'd be paying well over the odds if you're after a gaming screen if you were to buy a high end professional grade monitor like this. The other two models (S2440L and U2412M) showed low levels of motion blur, comparable to the U2414H and P2414H, but did suffer from some noticeable overshoot artefacts. There are dark trails behind the moving car as you can easily see, where the overdrive impulse was being applied too aggressively. We can also compare the PG2401PT against some other popular 24" models of recent times. 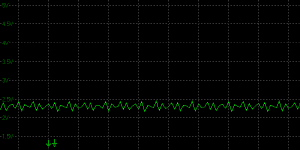 You can see that the Asus PA248Q (set at the optimum 'Trace Free' overdrive setting) performed very similarly to the PG2401PT, a fact confirmed also by our oscilloscope tests. The HP ZR2440w also showed low levels of motion blur, but there was some slight dark trailing introduced here. 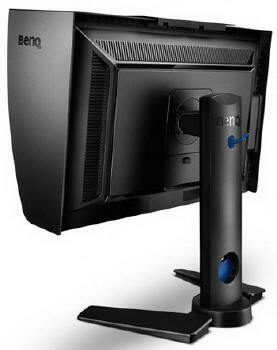 The BenQ GW2450HM's is based on an AMVA panel (as opposed to IPS) and while it was pretty fast for AMVA technology, it was not as fast as these IPS models and also showed some fairly noticeable overshoot as well in the form of dark trails. We have also provided a comparison of the PG2401PT above against 3 other higher end screens. These are models not specifically aimed at gaming or multimedia, and offer higher end features. The Dell U2413 is perhaps the PG2401PT's closest rival, featuring the same panel in fact and a similar feature set. It showed comparable levels of blur in practice, perhaps slightly faster but not by much. What isn't shown in these particular PixPerAn tests is that the U2413 had very high levels of overshoot, more so even than the PG2401PT. The U2713H was a similar story to the U2413, and so overall the PG2401PT is probably more suited to gaming and dynamic content as the overshoot is not quite a severe. The BenQ BL2710PT was a tad slower in practice than the PG2401PT but showed no overshoot problems. It doesn't feature some of the higher end features of the other models (wide gamut, hardware calibration, uniformity correction). 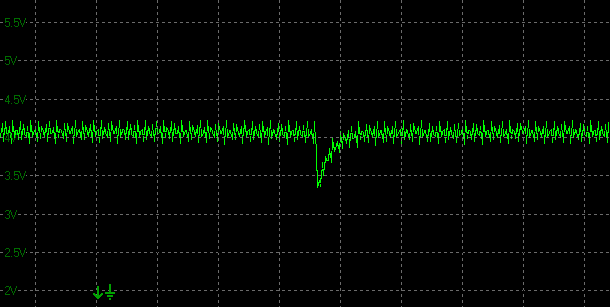 While these pixel response tests from PixPerAn show the BenQ to have pretty fast pixel transitions for an IPS panel and in these particular images there was very little overshoot shown, although we know that there is a fairly high amount from our oscilloscope measurements, even with AMA set to off. Beside the response time behaviour, there is something else going on as well here which can't be picked out by the camera. All of these other gaming models are running at 120Hz (or higher) refresh rates, which allows for improved 120fps+ frame rates and in some cases the support of 3D stereoscopic content as well. This can really help improve smoothness and the overall gaming experience so these screens still have the edge when it comes to fast gaming. Any additional extras to reduce perceived motion blur can also have a real benefit in practical terms, and again not easy to pick out with this camera method. The responsiveness of the BenQ PG2401PT was moderate overall. 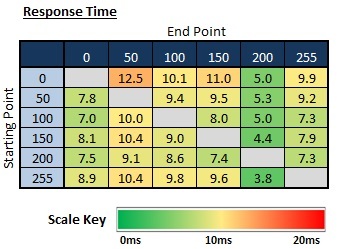 While the average G2G response time was about on par with the faster IPS and PLS models we have tested to date, there was unfortunately a fairly high degree of overshoot introduced. With AMA off this was still evident on certain transitions, and you'd certainly want to avoid AMA on as the overshoot is very apparent. The average 8.3ms G2G response time couldn't of course compete with fast TN Film models, but for an IPS panel it was good. The screen should be able to handle some fairly fast gaming without too much problem, although the overshoot could still be an issue in some cases. This screen certainly isn't aimed at the gaming market and those wanting to play fast FPS or competitive games may want to consider some of the more gamer orientated 120Hz+, TN Film based compatible displays out there, or perhaps something like the Eizo FG2421. Even better still would be models equipped with LightBoost systems or other motion blur reduction backlights for optimum motion blur elimination. BenQ focus their efforts on their XL series when it comes to gaming, so something like their new XL2420Z or XL2720Z would be more appropriate for gamers. On another note many gamers like to use exaggerated settings to make colours look brighter and more vivid. Wide gamut screens can serve this purpose well as they natively produces more saturated colours. This might not be strictly accurate but a lot of people prefer this more vivid and cartoony appearance and so it's useful that the option is available from the PG2401PT. There is also an sRGB emulation option if you want to revert to standard gamut as well. Aspect Ratio Control - The screen offers three options for hardware level aspect ratio control, available within the 'Display' menu as shown above. There are options for 'full' (fill the screen no matter what the source input resolution/aspect), 'aspect' (fill as much of the screen as possible while maintaining the source aspect ratio) and 1:1 (direct 1:1 pixel mapping of the source resolution/aspect). This should provide a good range of scaling options if you need them. Preset Modes - There is no defined 'game' preset mode available in the menu as the screen is aimed at high end colour critical work. You can of course set up one of the custom modes yourself if you want something brighter and perhaps more vivid for gaming. The BenQ PG2401PT showed an average total display lag of 25.4ms during the initial tests. This lag was moderate overall, equating to around 1.5 frames. 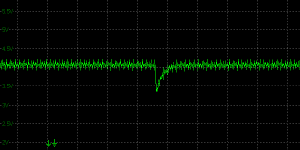 We measured half the average G2G response time as 4.15ms and so we can estimate that the signal processing is around 21.25ms. The lag is therefore class 2 as described above, although again the gaming experience is not the focus of a screen like this. 1x HDMI, 1x DisplayPort, 1x Mini DisplayPort, 1x VGA and 1x DVI connections. Decent choices for modern DVD players, Blu-ray, consoles etc. Good to see HDMI included here. Cables provided in the box for everything except HDMI. Light AG coating a positive change from older IPS panels providing clean and clear images, without the unwanted reflections of a glossy solution. Wide brightness adjustment range possible from the display, including high maximum luminance of ~314 cd/m2, but a minimum reduction of only ~109 cd/m2. This should afford you very good control for different lighting conditions although for darker ambient lighting the minimum adjustment is limited. Turning on the uniformity compensation feature can allow for a lower minimum luminance (down to around 63 cd/m2) but at the cost of a reduced contrast ratio. 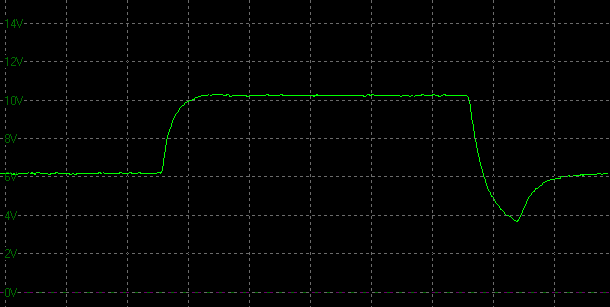 Contrast ratio remains stable across that adjustment range as well, but the backlight uses PWM for dimming control, albeit at a high frequency and low amplitude. Black depth and contrast ratio are moderate for an IPS panel at around 710:1 after calibration. Detail in darker scenes should not be lost though, and shadow detail should be reasonable. Dynamic contrast ratio is not featured on this model. There are no specific 'movie' preset modes available for movies or video so you will need to set up one of the custom modes if you want something specific for your movie viewing. Good pixel responsiveness which should still be able to handle fast moving scenes in movies without issue. Some overshoot problems on certain transitions even with AMA off. Don't turn AMA on unless you want severe and very noticeable overshoot. Wide viewing angles thanks to IPS panel technology meaning several people could view the screen at once comfortable and from a whole host of different angles. IPS glow is present at typical levels which may be distracting with darker content form an angle. No particularly noticeable backlight leakage, although there was some clouding from some of the corners. Thankfully there was none from the edges which is good. This type of leakage may prove an issue when watching movies where black borders are present but it is not a problem here. No integrated stereo speakers on this model. Good range of hardware aspect ratio options with full, aspect and 1:1 modes available which should be fine for most uses. Picture in picture (PiP) and Picture By Picture (PbP) are available on this model for those who need them. The PG2401PT overall was an impressive screen, especially considering it is BenQ's first venture into the professional colour enthusiast market. The screen certainly offered just about every feature and extra that you could want or need from a high end screen which was very pleasing. The stand was versatile and offered great adjustment choices, there are the useful ambient light sensor, human motion sensor, USB 3.0 ports and 8-in-1 card reader too. There are a very wide range of connectivity options, with cables provided for nearly all of them in the box, a monitor hood, touch-sensitive operational buttons, hardware calibration support, factory calibrated preset modes and even a very effective uniformity compensation feature. Extras aside, the IPS panel offered some very good all round performance in most areas. The GB-r-LED backlight offers a wide gamut for those wanting to work in Adobe RGB and other wide colour spaces. There's also a reliable and very well set up sRGB emulation mode if you prefer. 10-bit support is offered from the panel for those with a compatible workflow and the IPS technology itself provides stable and reliable colours from a wide variety of angles. There are a few areas which were a little limited though, perhaps room for improvement for future releases in this range. The contrast ratio of the display is only moderate for IPS at around 710:1 after calibration, but perhaps a limitation of the actual LG.Display panel as we'd seen similar from the Dell U2413 screen. The brightness adjustment range was limited at the lower end which could be an issue for some, and the PWM usage may put off some buyers. 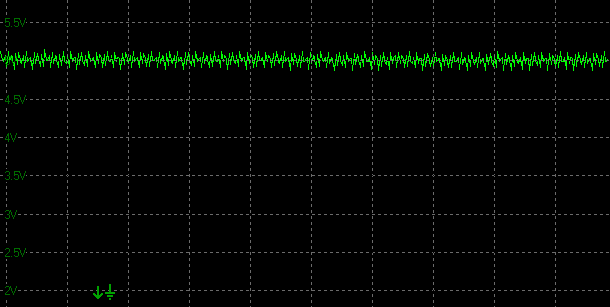 Having said that, using the uniformity compensation option helps with brightness range and the PWM frequency is very high so it is unlikely to be as problematic as common low frequency PWM usage. The response times were decent for an IPS panel but even with AMA turned off there were some overshoot issues which could be problematic for any gaming. We would like to see more control over the AMA feature perhaps if possible. Gaming isn't the intended usage for the PG2401PT so we won't worry too much about that or the moderate levels of display lag either. While the hardware calibration software was very good and offered a lot of options, the lack of brightness control from the OSD afterwards was annoying and the calibration process itself takes a long time. 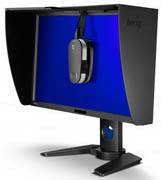 What you do get from the BenQ PG2401PT is a very capable monitor with an excellent default setup and a massive range of features, extras and options to play with. Some overshoot issues with response times, even with AMA off.